Wrexham midfielder Jamie Tolley says confidence is sky-high as they go into two tricky away games. A 4-0 home win over Histon on Saturday stretched Wrexham's unbeaten run to eight games and saw them go to ninth in the Blue Square Bet Premiership table. Grimsby are first up for Dean Saunders' resurgent Dragons on Tuesday night, with a trip to face Darlington awaiting them the following Saturday. "It'll be a good test for us with these two away games," Tolley said. "Going into it with six points you can't ask for better than that and I think that's eight games unbeaten." Tolley got the ball rolling against Histon with an early goal, arriving in the box in perfect time to convert Andy Mangan's inviting cross. 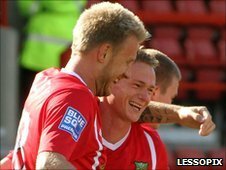 Wrexham were 3-0 up by half-time and added a fourth goal after the break to underline a fine performance. "We've been trying to do that all season and [against Histon] it's clicked and... it can only bode well for the next game," Tolley said. "When we play football like that I don't think many teams can get near us, it's working well so hopefully we can keep doing it. "It's totally different from the start of the season when everyone was a bit 'doom and gloom'. "Everyone is buzzing, everyone is looking forward to training, to the games and everything is clicking and coming into place at the moment."